Several of our local casinos offer some great choices for dining. That said I usually avoid dining in them because usually I have to walk through a smoky casino floor to get to them. My husband Bill suggested we try The Bistro at Fantasy Springs Casino in Indio. The online reviews were very good so I agreed to take a chance on casino dining. The ambiance of The Bistro is a little old school. You’ll find a dark square shaped bar near the entry where some people also choose to eat. A large open kitchen area and a sushi bar fill one side of the dining room. Bill and I were seated at a comfortable four top table and the service was both friendly and punctual. 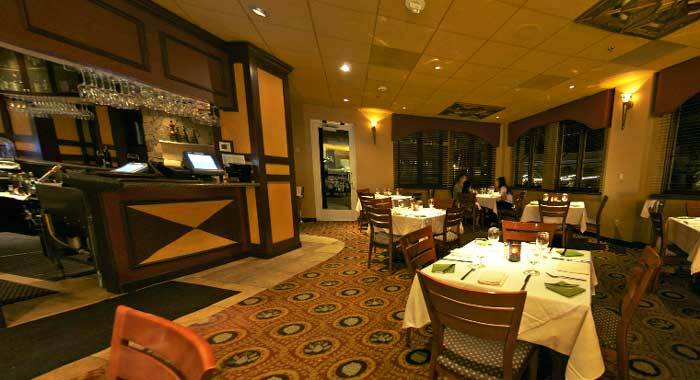 The Bistro menu is rather extensive offering sushi, steaks, fish, chops, salads and a number of appetizers. Normally when I find sushi in a non-sushi restaurant I pass, but our server Adrienne informed us that their sushi was flown in fresh from Hawaii almost daily and was very good. Before we ordered our food, I enjoyed a Slim-Tini cocktail with coconut vodka, pineapple, agave nectar, fresh lemon and toasted coconut on the rim. Simply divine! Bill chose a glass of Fume Blanc from the Bistro wine list. For starters I ordered the seared scallop-tempura shrimp roll from the sushi menu. Bill chose a vine ripe tomato with buffalo mozzarella salad that included imported Speck ham, EVOO, balsamic syrup and fresh basil. We sampled each other’s choices and enjoyed them both. Choosing an entrée was a little difficult because of all the choices. Adrienne helped me choose the Chicken and Crab Fontina with an organic chicken breast, lump crab, asparagus, mushroom risotto and a fontina glaze. I recommend this entrée, but you’ll likely be taking half home with you. Bill asked Adrienne to surprise him as he was torn between the lamb chops and a seared pork mignon. The double cut Colorado lamp chops made the cut and were cooked perfectly. A mild Khadrawi date curry sauce was listed on the menu but Bill didn’t detect any curry, which he really enjoys. Adrienne suggested we next sample a little date bread pudding. And while I wouldn’t really call this bread pudding, Bill and I made fast work of the delicious dessert with caramelized walnuts, vanilla ice cream, Grand Mariner anglaise with toffee sauce. We came to discover that our server’s husband is the food and beverage manager at Andalusia At Coral Mountain in La Quinta. I’m in Andalusia on a regular basis working with buyer and seller clients so I’ll make it a point to say hello on my next visit. And kudos to her for offering great service. The Bistro is a good choice for discovering a menu filled with lots of variety in a comfortable old school setting. From sushi to fish to big juicy steaks, everyone in your party will likely find something to enjoy. Bistro Dining Tip: Enter through the hotel entrance to avoid having to walk through the smoke filled casino. You'll find the Bistro located at 84-245 Indio Springs Parkway in Indio, just off the 10 Freeway. (760) 342-5000.